‘Sleepy Hollow’ was the rather dramatic name of the leafy plot on the corner of Palmeira Avenue and Eaton Road that Lewis Cohen sold at cost price to the trustees of the Reform Synagogue. The congregation had been growing since its inception in 1955 and had gotten too large for several temporary homes, including the Young Women’s Christian Institute on Holland Road. A new synagogue was designed by architect Derek Sharpe, and dedicated to the six million Jews who were killed in the Holocaust. Lord Cohen died in 1966 so sadly could not be present at the consecration of the new building in 1967. 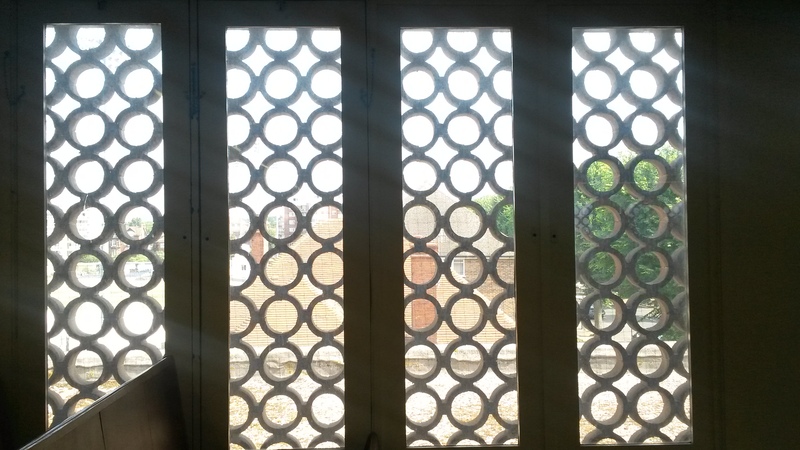 The Eaton Road side of the building is lined with screens of cement roundels which cover the south-facing windows. The principle entrance is located beneath a vaulted porch on the Palmeira Avenue façade, above which rather attractive stained glass windows and a triple-vaulted roof are found. I was lucky enough to be shown the interior by Gweni and Ivor Sorokin. The raised ground floor level contains offices and other smaller rooms. Below this is a basement level which was being used for language classes when I visited. The main synagogue, which seats 200 on rows of oak seats (with 200 more behind folding screens at the sides), is located on the first floor. The height of its ceiling is highlighted by the presence of a row of three stained glass windows – one window per roof vault. 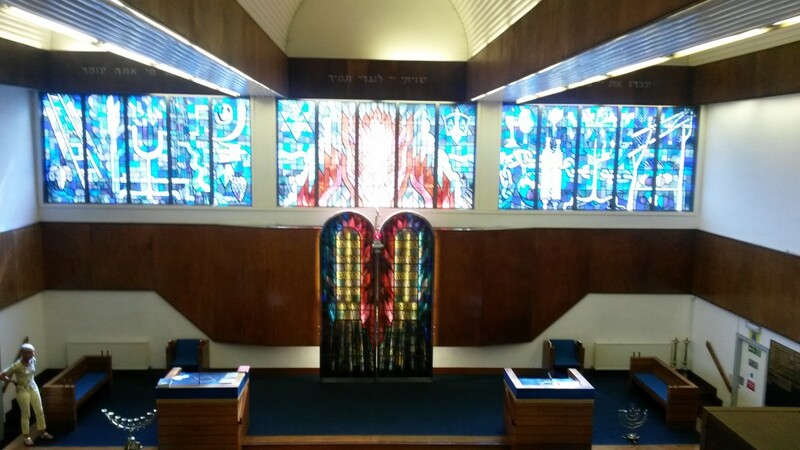 The stained glass artist John Petts included a variety of Jewish imagery on the three windows. The blue and purple left and right windows feature Jacob’s Ladder, a dove with an olive branch, a ram’s horn, a trumpet, a candelabra (to denote Chanukah), a scroll (to signify the Giving of the Law) and a wine glass and egg (to represent Passover). The red and yellow central window features a vivid tree of life beside the Star of David. Below is the Torah Ark. Heavy glass doors dramatically slide open to reveal the synagogue’s scrolls. Each scroll contains the first five books of the Bible; written by hand, right-to-left, in Hebrew, with special ink and a quill, without any punctuation or headings. Just as I was looking at a scroll from 1850, a Painted Lady butterfly flew from the brightest part of the window above and landed beside my hand. It really hit home that this is a truly magical building.